The TCG-WCB-2000 Dual Purpose Compactor / Baler are designed to compact waste and bale Cardboard. This extremely efficient unit takes up very little floor space while reducing Trash and Cardboard volumes up to ten to one. This mid-size Compactor and Baler provide waste reduction capabilities to companies of all sizes. By reducing the amount of waste brought to the dumpster and hauled away, companies save on contracted waste & cardboard removal costs while keeping their work environments clean. 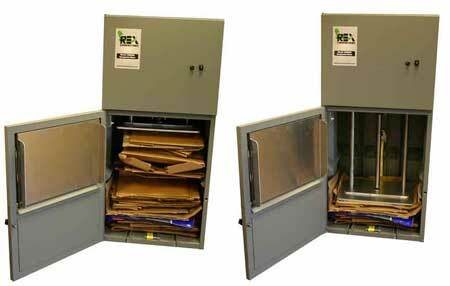 This versatile compactor / baler can easily convert from a waste compactor to a cardboard baler in just a few seconds. Restaurants, School Cafeterias, Hospitals, Hotels, Truck Stops, Grocery Stores, Ski Resorts and more. Reduce Trips to the Dumpsters as much as 70% allowing employees to spend time on additional job duties. Keep trash from piling up on the floor by the back door. Eliminate liquid spills from leaking bags on the floor, sidewalks and parking lot. 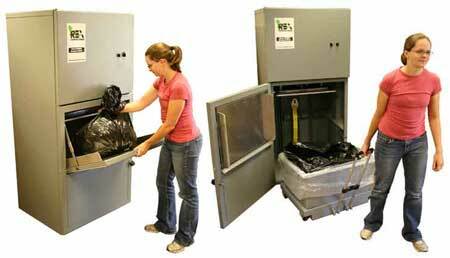 Eliminate dumpster overflows during the weekend and on busier days. Provide a cleaner and more sanitary environment. Keep the back door closed more often. Eliminate trash and cardboard runs after dark. * Warranty – One year parts and labor. * A 25% deposit is required at time of purchase and balance due on delivery. Note: Shipping will be invoiced extra. Rental Programs & Lease to Own Options are available. Please contact us for more information. Full one year parts and labor warranty on components and five year limited warranty on cabinet from date of receiving from factory, exclusive of labor, except as expressly assumed by manufacturer in writing. Warranty will cover all component parts of the TCG-WCB2000 compactor. All defective parts must be returned to factory, freight prepaid, upon receipt of written return authorization. Should the Model TCG – WCB2000 compactor not operate to written specifications within 90 days, Compaction Plus will accept return of the equipment and refund all monies received.